Son Power is the Holy Spirit at work in the life of the believer. Son Power works in our life as we continue to receive the revelation and understanding of the Holy Spirit. He is the divine power of God, the Lord Jesus Christ himself prompting us and empowering us to do his will. Son Power is sourced in God alone. Many passages in the Bible confirm that the sufficiency for living the Christian life is provided to us by God. It is not by self-power, self-effort, or self-reliance that we accomplish anything of everlasting value. Trusting in self to live the Christian life will always lead to failure. In John 6:63, Jesus said, “The Spirit alone gives eternal life. Human effort accomplishes nothing. And the very words I have spoken to you are spirit and life” (NLT). The Spirit of God is the key. The Spirit reveals what God wants us to know. The Spirit intervenes on our behalf. He also leads, guides, counsels, and helps us live the divine life as we trust in him, asking him to control our thoughts, feelings, and actions. 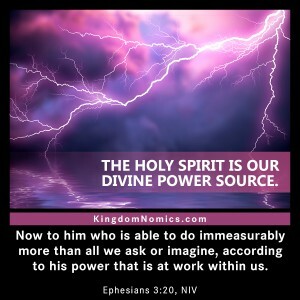 The Holy Spirit empowers us to accomplish all that God desires for us. Remember, when we accept Jesus into our life, we are transferred into a new paradigm where the power for living comes directly from God and not from ourselves. Lord, help me to avoid trusting in myself and my own strength to live the Christian life. Help me, moment by moment, to choose to trust in the Holy Spirit to live a life totally transformed by Jesus Christ. Amen.